The Durban Green Corridor is a cultural and environmental conservation project, an initiative of the eThekwini Municipality and the Duzi uMngeni Conservation Trust and primarily focuses on local job creation and social empowerment of community members and conservation of the uMngeni River. In the past there had been a lot of littering and glass bottles being dropped alongside the uMngeni River which posed as an environmental threat to the wildlife as well as the maintenance of a healthy river system. The Durban Green Hub called upon the assistance of The Glass Recycling Company and immediately forged a partnership to promote glass recycling in the area. The Glass Recycling Company followed through by placing a Glass Bank at the Green Hub’s office in Blue Lagoon. 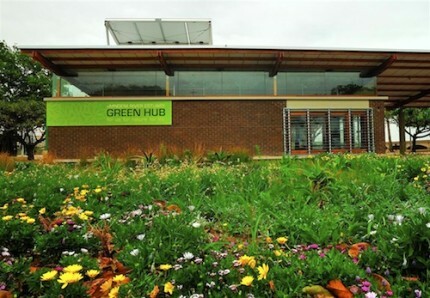 The placement of the Glass Bank at the Durban Green Hub which is right next to the uMngeni River estuary makes it more accessible for the public and restaurants to use the Glass Bank. TGRC also provided them with clean up bags for their monthly clean – up projects. With this on-going partnership the public and restaurants can now deposit their glass into a glass bank where before it was thrown away and ending up in the environment.